You can keep your partners, team, and colleagues in the loop as well as engage them with important or interesting stories by using the News feature on your team site. You can quickly create eye-catching posts like announcements, people news, status updates, and more that can include graphics and rich formatting. In addition to the web experience described below, you can also create and view news from the SharePoint mobile app for iOS. For a visual overview of News, check out the infographic, Read all about it: Microsoft SharePoint News, which can be downloaded as a .PDF or PowerPoint template on Ways to work with SharePoint. 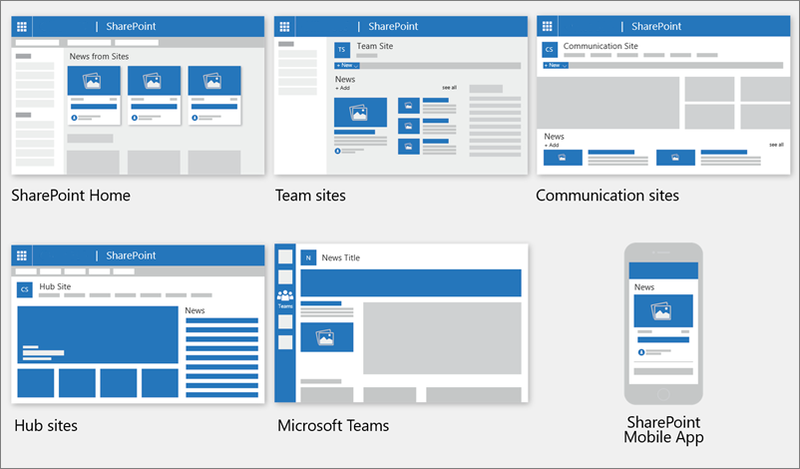 News is shown on the SharePoint Home page, on team sites, communication sites, hub sites, and on the mobile app. You will even be notified on your mobile device when news is published. You can also choose to show News in a Teams channel. 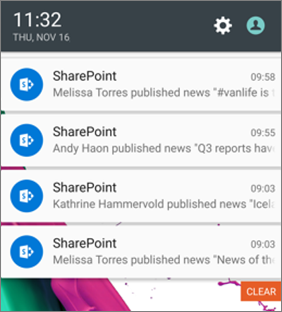 When an important, relevant news article is posted by someone in your close sphere of work, or posted to a site in which you are active, you will receive a notification on your mobile device ‘from SharePoint’ within your device’s notification tray. When you click on a notification, you are taken directly into the SharePoint mobile app to view the news article and all its data-rich, interactive content. News can come from many different sites. but there might be an "official" or "authoritative" site for organization news. 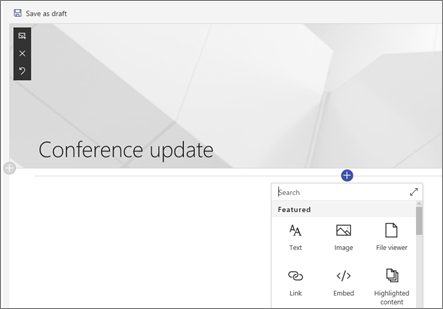 News from these sites are distinguished by a color block on the title as a visual cue, and are interleaved throughout all news posts displayed for users on SharePoint home in Office 365. 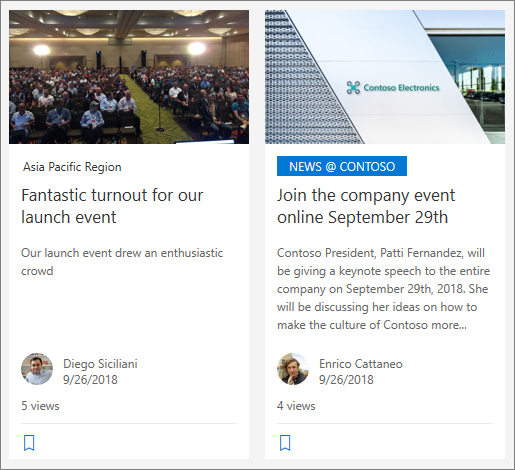 The following image shows news on SharePoint home where News@Contoso is the organization news site. 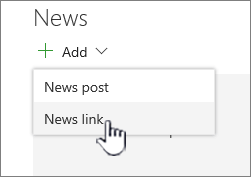 In SharePoint Online, you can add news posts from your SharePoint home page. At the top of the SharePoint Online Home page, click Create news post. Choose the site where you want to publish your news post. You'll get a blank news post page on the site you chose, ready for you to fill out. Create your news post using the instructions Create the news post. By default, News is at the top of your team site and under the hero on a communication site. Click + Add in the News section to start creating your post. You'll get a blank news post page ready for you to start filling out. Create the news post using the instructions Build the news post page. 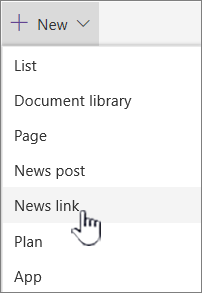 In SharePoint Online you can add a link to content from your site, or from another web site with the News link. The linked content will appear as a news post. Note: Not available in SharePoint Server 2019. Go to the site with news where you want to add the post. From the home page, click + New and then click News link. If you're on another page and don't see News link as a menu option, add a News Web Part to the page first, and then click + Add under News. In the Link field, paste the web address to an existing news item. You will see several more fields. In the Title image field, add a title that will be shown for the news item on the home page. This is a required field. Recent Images returns images that you've recently used or added to the SharePoint site. Web search does a Bing search for images on the web in a selection of categories. You can set filters for size (small, medium, large, x-large, or all), layout (square, wide, tall, or all), or Creative Commons or all images. OneDrive shows you the OneDrive folder associated with the site where you can navigate and select images. Site offers document libraries on the SharePoint site where you can select images to use. 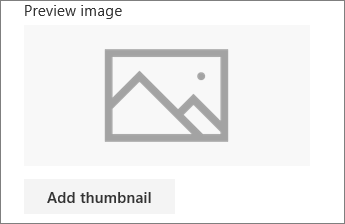 Upload opens a window where you can select an image from your local computer. From a link provides a filed to paste in a link to an image in OneDrive for Business or your SharePoint site. You can't link to images from other sites or the web. Click Open to use a selected image. Add or edit the description in the Description field. This is optional. Click Post to add the link to your news. Begin with adding a name that will serve as your headline. You can use the image toolbar on the left to add or change an image. Click + to add web parts such as text, images, video, and more. Learn about using web parts on SharePoint Online pages. When you are done creating your page, click Post news at the top right, and you'll see the story appear in the News section as the most recent story. 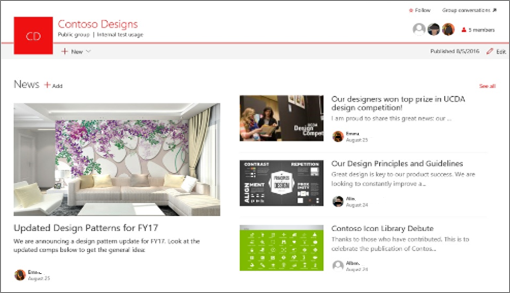 The news is also displayed on the SharePoint home page, and may be displayed in other places you choose. Additionally, the people you work with and the people who report to you are notified that you've published news in the SharePoint mobile app. Once published, your news posts are stored in the Pages library of your site. To see a list of all your news posts, See all in the upper right of the news section on the published page. By default, stories are shown in chronological order from newest to oldest based on their initial publish date (editing a story will not change its order). Posts can be reordered using the Organize feature in the News web part. Go to the site that has the news post you want to remove. Click See all in the upper right. of the news section. If you don't see the See all option, click Settings, select Site Pages, and from the list, select and then delete the page you want to remove. Find the page you want to remove. Click the ellipses (...) to the right of the page, and then click Delete. In the Quick Launch bar, click Pages, and then select the news item you want to delete. Click the ellipses (...), and then click Delete. Click Delete in the confirmation dialog. Go to the page that has the news section you want to remove. Hover over the News section, and click Delete on the left. If you removed the News from your page, you can add it back. Or, you can add it to a different page. To do this, you can use the News web part. Select the News web part. For more information on using the News web part, see Use the News web part on a SharePoint page. Note: For more information on working with web parts, see Using web parts on pages.